View more documents from Blueinfy Solutions. AppPrint scans IP range, IP or host for Web and Application servers. It scans port 80 for a particular target and tries to deduce the banner using httprint methodology. This gives best guessed banner for Web Server. In next step it uses method of forced plug-in invoke and scan for application server type. At this point it tries to fingerprint Tomcat, WebLogic, WebSphere, Orion, ColdFusion and Resin. 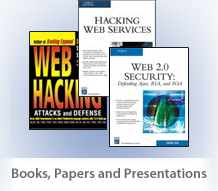 It also fingerprints Web 2.0 libraries and components. It requires .NET framework installed. In future version we will build several other technology mapping and fingerprinting technologies like Flash, Laszlo etc. Also, planning to add WAF fingerprinting module. View more presentations from Blueinfy Solutions.